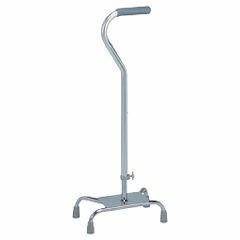 Carex Large Base Offset Quad Cane are ideal for people who are independent enough to use a one-hand walking aid, but still need the stability that four points of floor contact can provide. Adaptable for right- or left-hand use, quad canes have a low center of gravity for increased stability and balance. The small base size model can be used on stairs, while the large base size model offers increased support.